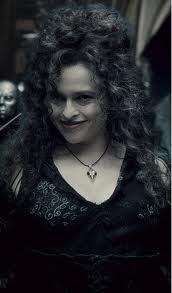 What are some of your favorite Bellatrix "moments" in the books or movies? "Avada Kedavra! !, oh its just a fox"
"Cissy you wouldnt, not your own sister"
*singing** "I killed sirius black! hahahhahaaaa"
"Never used an unforgivable have you? You need to MEan them!Potter"
"The dark lord.. i believe....... is mistaken." "My lord, it is an honour to have you here in our familys house. there can be no higher pleasure"
"STOP do not touch it. we shall all perish if the dark lord comes now!" "What will happen to your children when ive killed you? When mummy's gone the same way as freddie?!" Hehe, I love all those quotes! I love it when she cackles too and when she says: CRUCIO! I love all those quotes too but I have to ask, did Bella kill Fred since she's sort of implying it? no fred was murdered by rookwood because right after e dies percy goes "ROOKWOOD" he might have been the cause of the exploding wall though...way to go rookwood! "I don't trust you Snape as you very well know"
"Avada Kedavra! !, oh just a fox... I thought perhaps..."
"You lost your authority when you lost your wand"
"Gold! Take your gold, filthy scavenger, what do I want with gold? I seek only the honour of his - of-"
"If she dies under questioning I'll take you next, bloodtraitor is next to mudblood in my book"
"A copy? Oh a likely story!" i luv all of spinners end in the 6th book!!!!!!!!!!!! "When Muummy gone the same way as Freddie?" i can hear her saying that like when she sung "I killed Sirius Black!" "haha he knows how to play, itty bitty baby..POTTER"
"Nevile Longbotom, hows mum and dad?" I've killed Sirus Black hahah are you going to get me?!" "Sorry Dumbledore we'd love to stay and chat but were on a tight schedule"
I agree with sltherin360!!!! Bella is awesome!! were pure bloods- because were better than u!!! i loved it when she went skipping away singing "I KILLED SERIOUSLY BLACK HAHAHAHAH"
"I KILLED SIRIUS BLACK! YOU COMING TO GET ME?" "Hagrid? Hello?" Love how she says it. Sounds insane. "Now he knows how to play! Itty...bitty...baby...POTTER"
When she laughs and says you dirty little monkey to Dobby. "neivel longbottom is it. how mum and dad?" "you dare speak his name. You dirty hald blood"
"he knows how to play itiy bity baby potter"
The Dark Lord shall rise again! Throw us into Azkaban! We will wait. Bellatrix: "You could have killed me!" ^ I loved that part lol. "My lord I'd like to voulnter myself for the task"
My favorite is when she's teasing harry. "I killed Serius Black! I killed Serius Black! Are you coming to get me?!" I said somthing similar to my cosin kind of hysterically and now my nick name of the family is Bella. And to make it better it's thanks giving so now everyone knows.So really funny relation to this phrase. Favorite From Deathly Hallows before she tortures Hermione. "Let's have a chat GIRL to GIRL!" ohhh and in Half-Blood Prince when Dumbledore says "ahh Bellatrix, I believe introductions are in order" then she says "Love to Albus, but we are on a TIGHT SCHEDULE!" What book is that in I dont remember. my fav part is when she says ''YOU FILTHY HALFBLOOD its such a funny comment. "...bloodtraitor is next to mudblood in my book"
When she.saw that guy had the sword and she said "Where did you get that from? "and when that chandalier fell and she screamed! "or dear Bellatrix,who plays with her food before she eats them?" "He knows how to play itty bitty baby,Potter." My favorite quote is in the Half-Blood Prince when Bellatrix says: "Love to Albus, but we're on a bit of a 'tight schedule'." The way she says "tight schedule", is just soo Bella! !